BJP Compares Siddaramaiah Government To Kerala, Bengal Over "Political Murders"
"Never in Karnataka history had people witnessed political murders in large numbers. Karnataka, under Siddaramaiah, is following West Bengal and Kerala models for committing political murders," the Karnataka BJP Digital Communications Team said. 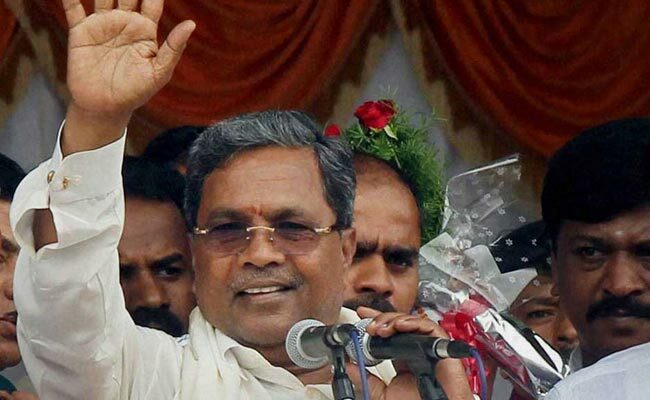 Bengaluru: The Karnataka BJP has alleged that the Siddaramaiah-led government in the state was adopting the West Bengal and Kerala models for targeting its workers and "committing political murders". The Karnataka BJP Digital Communications Team made the accusation in a statement yesterday on social media site Facebook. "Never in Karnataka history had people witnessed political murders in large numbers. Karnataka, under Siddaramaiah, is following West Bengal and Kerala models for committing political murders," it said. The team also alleged that never in the state's history had a state minister been charged as the first accused in a case related to the death of a senior police official, in a reference to the then home minister KJ George. The CBI had in October last year named KJ George as an accused in an FIR filed in connection with the alleged suicide of Deputy Superintendent of Police (DSP) M K Ganapathy. The BJP social media team also said that Prime Minister Narendra Modi -- during his February 4 public rally here -- had rightly pointed out the "ease of doing murder" in Karnataka. The team also hit out at Mr Siddaramaiah for claiming that Karnataka's crime rate was lower than that of Uttar Pradesh and Madhya Pradesh. It is wrong to compare a progressive state like Karnataka to Uttar Pradesh and Madhya Pradesh, which are facing different problems due to high density of population. "This is an insult to Kannidigas", it said. Countering the chief minister's barb that PM Modi had no right to speak about corruption especially when the BJP's state chief BS Yeddyurappa had gone to jail on graft charges, it claimed there were over 67 cases pending against Mr Siddaramaiah in the Lokayukta and the Anti-Corruption Bureau. In the flip side, all cases against BS Yeddyurappa have been quashed by the Karnataka High Court and no court in India has convicted the strong Lingayat leader on any corruption charge, the BJP said. Hitting out at PM Modi for his all-out attack on his government, Karnataka Chief Minister Siddaramaiah had yesterday accused him of telling a "tissue of lies" and said that he was "morally not fit" to be the Prime Minister of the country. In a stinging attack on the Siddaramaiah government on all fronts, PM Modi had in the rally accused it of setting new records in corruption and asserted that the countdown for its exit has begun. Reacting to Siddaramaiah's comment that the Modi government has not waived farmer loans, the party's digital team alleged that as many 3,500 farmers have committed suicides in the state under his government. The team also said that the chief minister conveniently forgets to mention the waiving of loans to the tune of Rs 36,000 crore and Rs 30,000 crore by the Uttar Pradesh and the Maharashtra governments, respectively. On Mr Siddaramaiah's claim that his government had built the world's largest solar plant in Karnataka, the BJP said only about 400 MW is operational out of the 2,000 MW. Further, the central government granted Rs 800 crore to Karnataka for setting up dedicated feeder lines for supplying uninterrupted power to farmers, it claimed.